Bio-antioxidant is a combination high-grade composition that is produced in accordance with the pharmaceutical guidelines. It contains 12 primary vitamins and 6 minerals, including selenium patented formulation SelenoPrecise® and other important antioxidants. 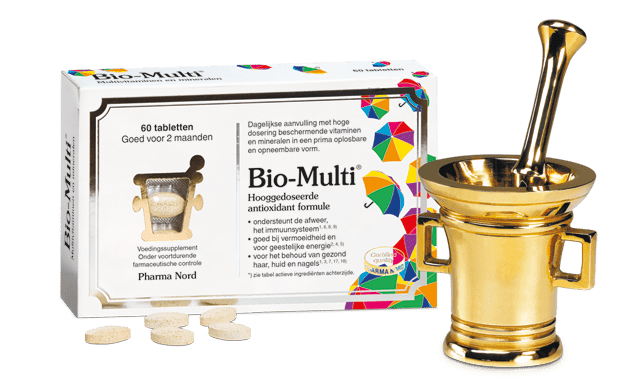 Each tablet delivers a high dose of the most relevant vitamins and minerals, including the B-group vitamins. Bio-Antioxidant contains no iron because not everyone can benefit from iron supplementation. People who need extra iron, use a separate supplement containing organically bound iron. Nu van 25,66 voor slechts 19,77!